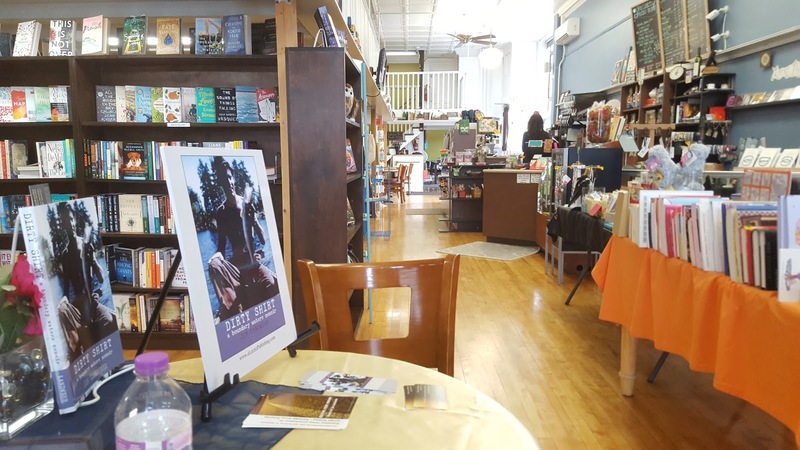 I had another book signing event on Saturday. 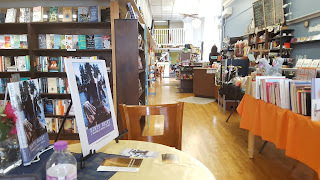 This time it was held at Tribeca GalleryCafe and Books in Watertown, a great little town about 45 minutes from Waukesha. I was approached by the owner last winter about booking a signing which I was grateful for. Most of my marketing has to be done by me, so when they come to me, I act. As I assembled my stuff for my standard presentation - projector, laptop, placard and books, I kind of griped a bit to Donna about how I am getting tired of giving the "Dirty Shirt show." We both laughed a little and she said, "You need to get your new book done and out there." It has been three years since it came out and I have probably given the spiel a couple dozen times. And while I get a little charge out of doing the reading/slide show/presentation, I feel it's become a little like the number one hit by a band that they've play because they have to for the fans. Not that it's become something I dread, just a little robotic is all. As it turns out I never gave the presentation. It was a small venue, with a small crowd, and I ended up just selling a few books. The upside to it though was that I had some great conversations with each of the guys that bought books. Some had lived near the BWCA, while others had visited there. One guy even said he'd always meant to get up there for his 40th birthday, but never got around to it. So, yeah, I had my inner extrovert in high gear for the signing. I tend to do that when I get to talking about my book. I find people and their stories fascinating. My wife thinks this is kind of shocking and hysterical because she knows the real me. I'd never leave the house if I could get away with it. Yet I do it, and every time I do these signings I am glad I did. I guess the moral of the story is that the experiences I've had with Dirty Shirt have been invaluable in preparing me for the next book. In case you're wondering, I hope to have it through my final edits sometime in the next 30 days. Then it's off to the publisher to see if they like it as much as I hope they will. With a little luck I hope to have it released in late 2017 or early 2018. I love how it came together and can't wait to get out there and push it like I did with Dirty Shirt.